We took this picture yesterday during an inspection, it had so many issues, I thought it would be interesting to share. a) it is too low, the chimney's top should be 2 feet above any part of a roof with in 10 feet. This one is about 14 inches too short. Likely will have poor drafting issues in wind. b) It has no spark arrestor / rain cover. With nearly 40 inches of rain a year, an open flue can have lots of problems. It did! c) no crown, this is the top most part of the chimney, made of mortar, that slopes away from the flue opening, protecting the horizontal surface of the chimney from water. 2) The joint from roof to chimney is covered in tar, this connection will almost always fail and needs flashing & counter flashing. 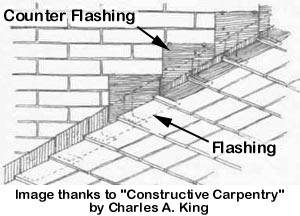 If properly installed will not leak and last as long as the roof. 3) Open mortar joints, they are gapping, allows water in and leaves the bricks loose. 4) Missing tabs, blown off roofing. Should be repaired with new roofing. 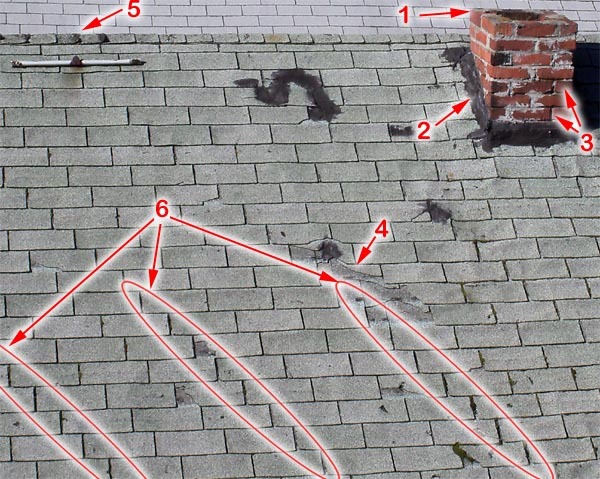 5) The ridge is completely worn out, there is significant grit loss exposing the ridge to sunlight, and this causes the roofing to shrink and crack. 6) If you look carefully, notice that every 3rd row of roofing has bigger gaps then the rest. 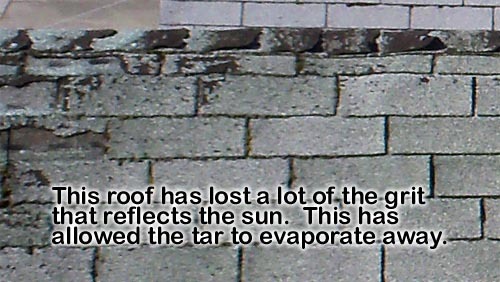 This is caused by the shrinkage of the roofing. This is 3 tab roofing, so every 3rd tab is actually a separate piece of material. When it is new all the gaps are the same size, but as it ages, every 3rd gap opens up as the roofing shrinks. This is caused as the petroleum evaporates away from exposure from the sun. Also you can't miss all the tar patches, granule loss and curling.